The folks at J&D's Foods have done it again! 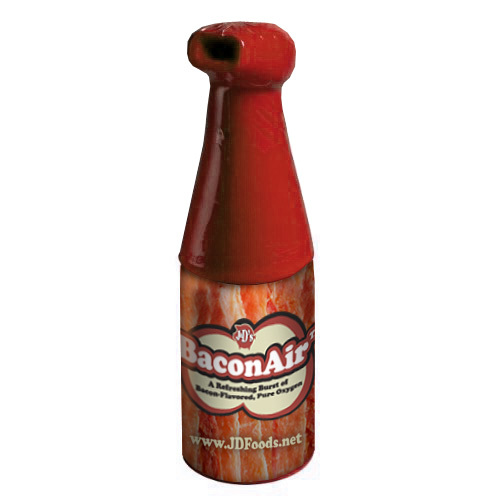 Now you can literally inhale your bacon! 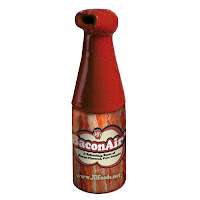 Following in the footsteps of the bacon baby formula, they're introducing the BaconAir, bacon flavored oxygen inhaler. "Hungry for bacon but don’t want the calories? Try BaconAir! Competing in a sporting event or spelling bee? Try BaconAir! Vacuuming the house? Try BaconAir! Taking a test? Try BaconAir! Driving a race car or semi-truck? Try BaconAir. If you want to run faster, jump higher, look and feel more attractive or memorize long sequences of numbers – try BaconAir! We are still waiting for our first shipment of bacon-flavored Himalayan oxygen, but for now you can put your name on the waiting list above. We have very limited quantities and a big demand already, so you should act fast." Wait... what day is tomorrow? Oops, looks like Time Magazine, the Gothamist and the Village Voice already fell for it! Well played, guys. I love you.